The freshly blonde Aaron Kwok (郭富城) rushed back home after attending a charity event, but it wasn’t to see his family—but his new car. An avid car lover, Aaron has always had a habit of collecting exclusive luxury cars, each easily being worth over a million HKD. On December 1st, Aaron rushed back home after the charity event to welcome a new package—his new car. The source managed to snap a picture of Aaron’s new car. The actor-singer was happily conversing with a friend and taking pictures of his new purchase. Aaron’s new sports car is reportedly an exclusive release, with only 500 cars in existence. 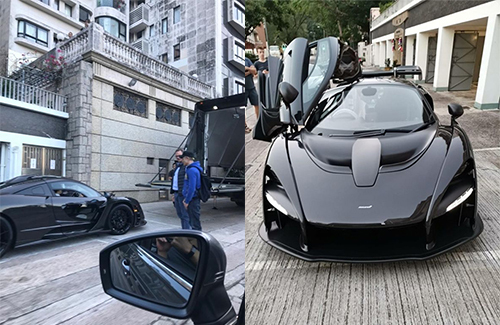 Named after the Brazilian Formula One race car driver Ayrton Senna, the car is reportedly worth HK$7.5 million. i know that cars are his hobby but the first thing that came to mind was – it’d be nice to give some $$ to charity or to build schools in rural china instead. even just for half of the amount would greatly benefit the poor. even a better reason to donate. got 7.5 m to spare, that’s plenty of $$. i would if i had 7.5m to add another luxury car to many existing luxury car collection. @m0m0 well, it’s his money so he could whatever he wants with HIS money. There’s nothing wrong with that. That’s like me telling you how you should spend your own money…. @m0m0 if you earn a lot, you should be able to spend as you wish. We all work towards our own goals in life and find pleasure buying things we like. Thats his hobby, he’s reached there through his own hard work, no need to judge what he should or shouldnt be enjoying with his money. Any way whos to say he doesnt already donate anything to his own charity? @megamiaow Exactly. As long as they aren’t harming anyone in the process, it’s nobody’s business but their own how they go about spending their money.